Woke up at 8 this morning after a late night last night. 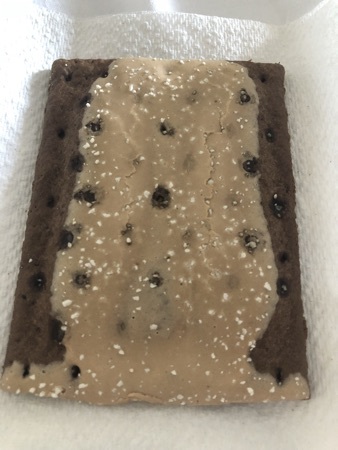 Dd had fruit loops for breakfast, I had a salted caramel pop tart, they don't look massively appetising but they're delicious! Then we shared one of the cupcakes in the fridge, this time we had the monorail cupcake, this is my favourite so far! 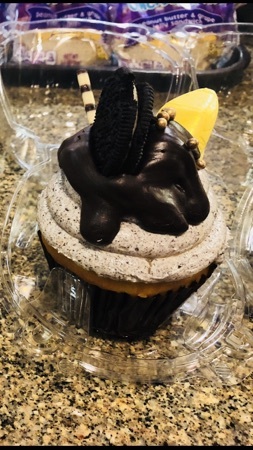 It's vanilla sponge filled and topped with cookies and cream frosting, drizzled with dark chocolate ganache with a white chromate monorail, an Oreo and a chocolate stick on top. I had booked the DVC painting with a view event for this afternoon so we decided to have a morning in the pool, we got ready and walked down to the contemporary pool for an hour. The contemporary pool seems so much quieter than bay cove pool, I think we prefer this one. 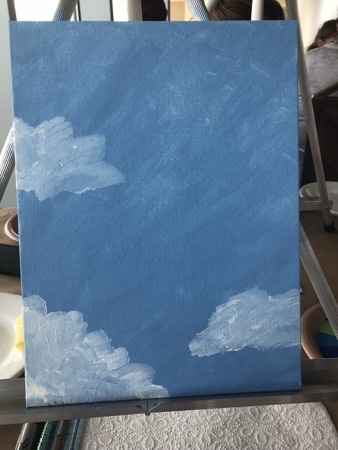 got out and went and got sorted for painting with a view, check in was at the bottom of the elevators heading up to the top of the world lounge. When we arrived we had to find out easel at a table which had our name badge. 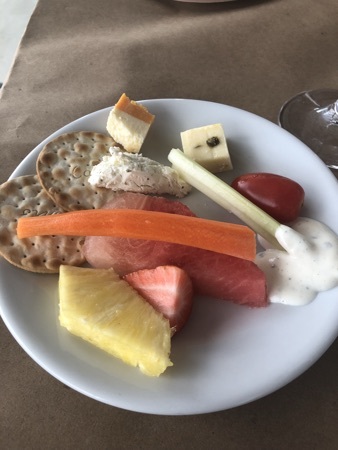 We could then help ourselves a to some nibbles , there was a selection of fruits, crackers, cheeses, veggies and a dip. 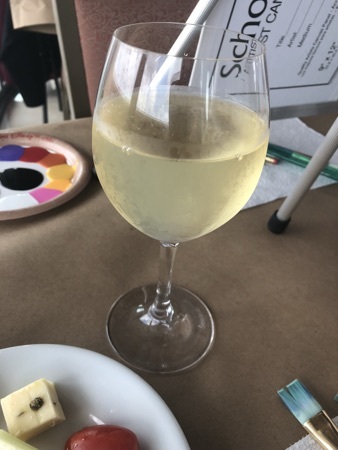 We could also order an alcoholic beverage so I went for a glass of reisling which was very nice. It was quite a fun activity to do but not sure I would pay $50 to do it again. It lasted about 2 and a quarter hours. After the painting class I dropped my picture off on our room and walked on over to magic kingdom to meet dd and DH. We were planning on riding seven dwarfs together with a fastpass but unfortunately it was closed due to the weather. 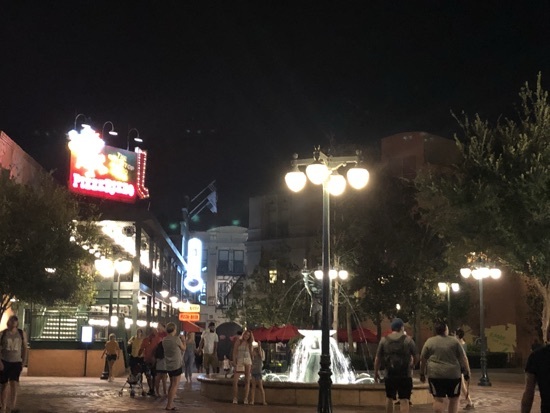 We could use our fastpass on anything else but we decided to make our way to millers ale house at crossroads for some dinner. The car park was really busy when we got there but it was really quiet inside. 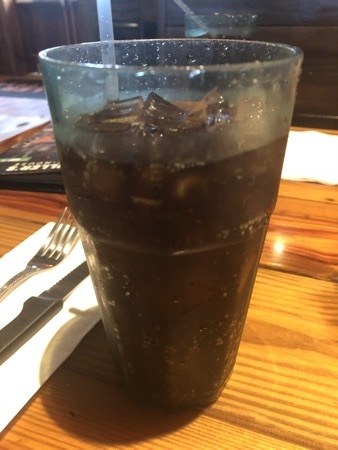 We ordered a Pepsi each and DH and I decided to share two choices. First up was the zinger mountain melt, this cost $12.49. 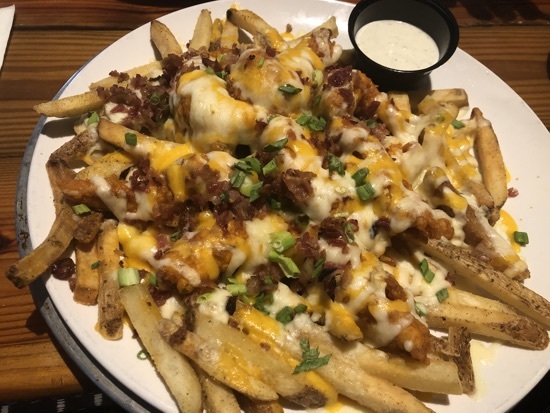 This is chicken strips in medium garlic sauce, Fries, scallions, bacon and cheese all in a big pile served with ranch dip. These are really tasty and a massive portion. We also got some pan fried pot stickers (pork dumplings), these were served with sweet chilli dip, $8.99. 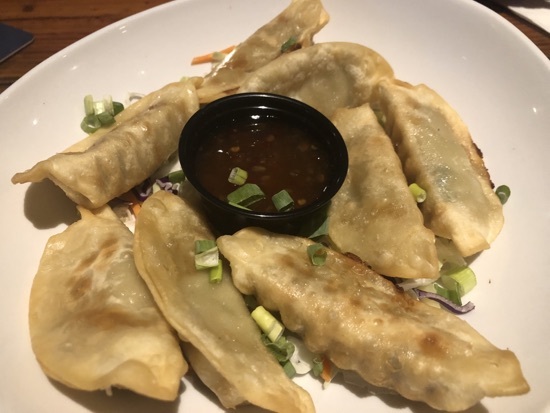 These were almost as good as the Ohana pot stickers, if they had come with peanut sauce they would have been equally as good! 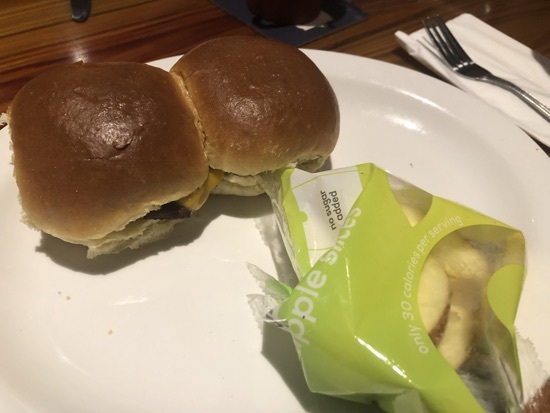 Dd had the kids mini burger meal, with apple slices, this was $4.99 and an extra $1 to have cheese added to them which I thought was abit excessive. They tasted pretty good but this was quite a lot for a child. We made sure we saved room for pudding, we got the captain jacks buried treasure cake. 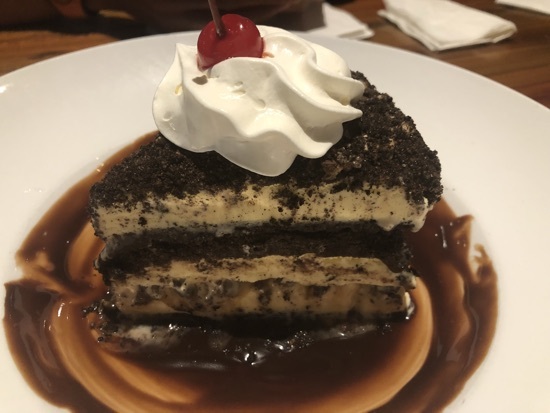 This is an ice cream cake with chocolate sauce, caramel and Oreo crumbs, it is absolutely delicious! It's also a huge portion for $6.49 and enough to share between the 3 of us. 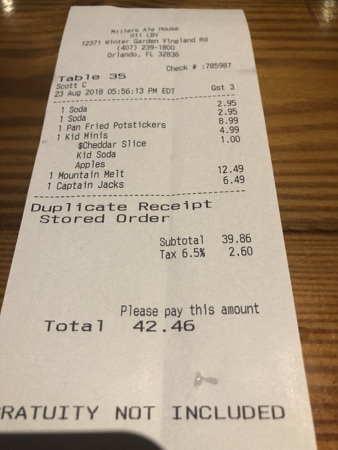 Our total bill came to $42. 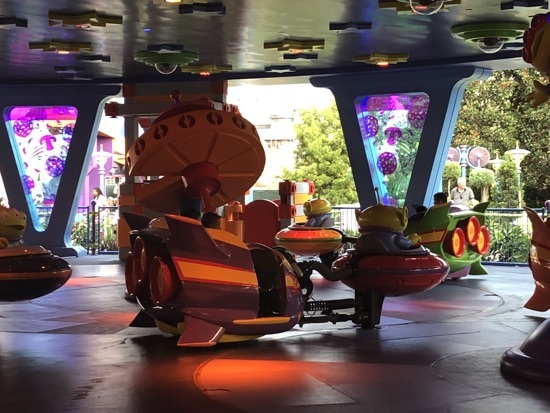 After the alien saucers we had a fastpass for toy story mania, unfortunately just before we were due to board they had to stop the ride as someone had unfortunately emptied the contents of their stomach part way round, so our wait ended up being longer than anticipated. Next up was a fast pass for star tours, it was all completely new bits for me, I always seem to get the rainforest one. DH and dd then rode this again in the standby line while I had a wander round, the park down this end was really quiet and has changed quite abit. 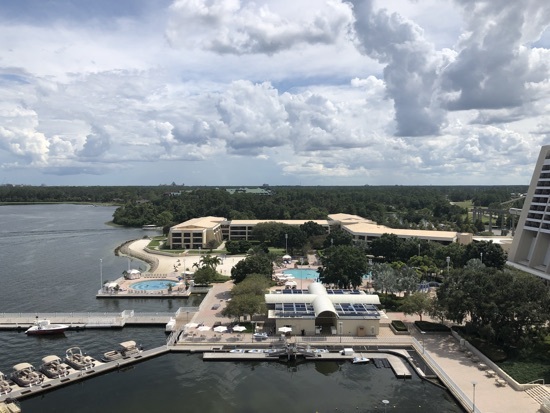 We decided then to call it a day and drove back to bay lake tower where we watched the electrical water pageant from the balcony with a drink. 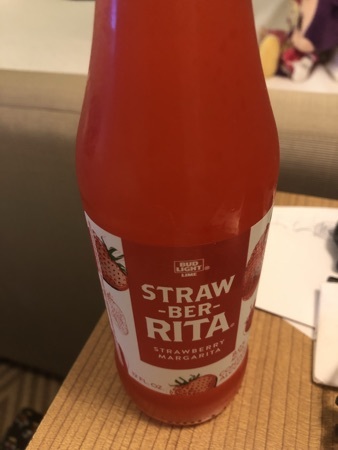 New Photo Added by missdopey - 24 Aug 18 12:42 PM. Is that your painting ? I like the sound of this mornings cupcake the best I think! 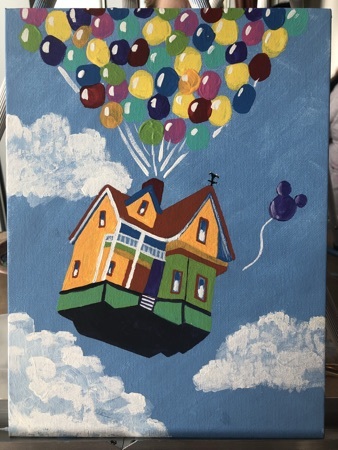 Its nice to see some other activities - I've never heard of the painting thing before. 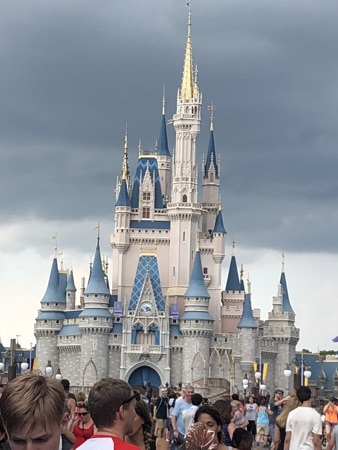 You didn't have the best of luck with your seven dwarfs and TSM rides today.